What does Budokai Card Club mean for players? Budokai Card Club is a community service for players and supporters of the Dragon Ball Super Card Game. 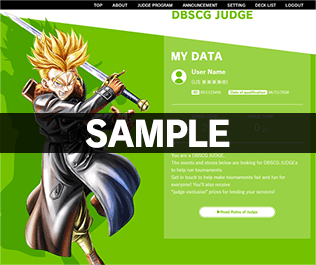 Register with Budokai Card Club and follow the steps to become a judge, and you can host your own tournaments, help run large ones, and generally contribute to making the Dragon Ball Super Card Game even more exciting. Join the Budokai Card Club and help us make the Dragon Ball Super Card game better than ever! *This is provided by Carddass Club. *This is available only in Australia, New Zealand, Canada, Singapore, Philippines, Mexico, Chile. If you decide to contact them, you need something to prove you are a Judge. So please prepare something in advance, like a screenshot of the Judge Page showing you are an official judge. Even if someone who is NOT an official judge contacts an organizer, that person will not be able to judge organized play events. The Level 1 Judge Exam will be closing temporarily on March 15th. We will announce when the exam re-opens on the BCC for players and the official website.